Just regular folks. : It's only Monday. I over scheduled our weekend. I enjoy being busy, but you know, when you stick try and stick that one extra thing in, then it just results in a meltdown of one of the family members. 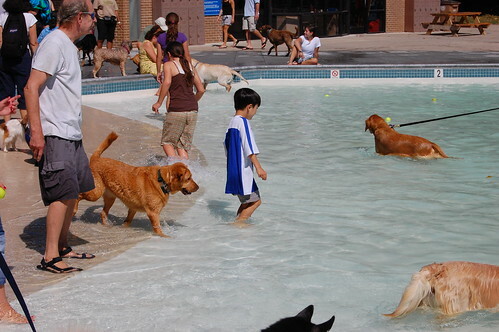 Our town had a doggie swim day, the last day before they drained the pool. Vince basically screamed his head off all the way to the pool. As soon as he got there, he was fine and happy. Vince has not been eating well. I can't believe that my non-Rett Syndrome kid is the one who is not willing to eat! He basically eats about 6 glasses of milk a day and plain white rice (and of course, anything made out of sugar). He will just sit there and purse his lips and then burst into tears! And he's running around all day, neighborhood kids, swinging, swimming and then when he has to change gears and sit down and eat/do homework/pick up clothes, the tears come again which is caused by his exceedingly low blood sugar. Tonight, after work, I made him his favorite dinner - ravioli, and finally (after days of not eating well) he ate 2 full plates. It is tough to be a Mom! your are right, i would excpect the feeding issues to be Edda's! I am glad to hear he ate awesome last night! I have a child like that, and of course it is the easy child. Chocolate milk is our saving grace when she is running on empty. Thankfully, when she actually eats, she is a good eater.